Unique design offers horizontal crash protection. Unit is easily inserted into base plates then locked into place. Base plate includes four pre-drilled mounting holes. Removable black rubber end caps. Welded steel construction with yellow powder coat finish. 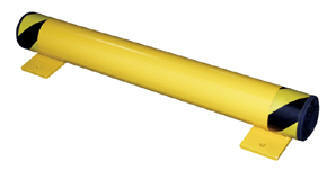 ER-FSBOL-24 Floor Stop Bollard 5" 24" 4-1/2"
ER-FSBOL-36 Floor Stop Bollard 5" 36" 4-1/2"
ER-FSBOL-42 Floor Stop Bollard 5" 42" 4-1/2"
ER-FSBOL-48 Floor Stop Bollard 5" 48" 4-1/2"